This week, MDA launched a new web-based Clinical Trials Finder Tool powered by Antidote. Designed to help you locate ongoing clinical trial participation opportunities across the country, the tool asks a series of questions to pinpoint trials specific to disease type, progression, age and other eligibility criteria. In just a few minutes, you can gain access to vital research that directly impacts you and families like yours. Having trouble? Here are some questions we have received and answers that should make using the tool as seamless as possible. Why doesn’t anything come up when I type in my answers? For the “fill in the blank” questions about your disease type, location, etc., start typing in the first few letters of your answer and then wait for the form to populate a drop-down list for you to choose from. Why can’t I find my disease type? Begin by typing out your full disease name, rather than using acronyms. (For example, type “Duchenne muscular dystrophy” rather than “DMD.”) As you type, the tool will recognize the disease you’re looking for and will provide a drop-down list of disease names for you to choose from. Choose from the drop-down list. I can’t find any trials near me. What should I do? When using the finder tool, we recommend that you first choose “any” for the distance. That way, you’ll be able to see all trials you may be eligible for, regardless of location. Many trials have travel programs that may make it possible for you to participate even if the institution is not close to your location. I completed all of the questions and can’t find any trials for me. Are there any trials being done for my disease type? After you answer the initial questions (disease type, city, age, gender), you’ll then be taken to our partner’s website (Antitode) to complete your search. There, you’ll be asked one or two more questions, and then will see “View the X trials found” link in green letters appear right above the questions. Click that link if you’d like to see a larger list of trials that you may be eligible for. You can skip the additional questions and go directly to the trials. I have an undiagnosed neuromuscular disease. 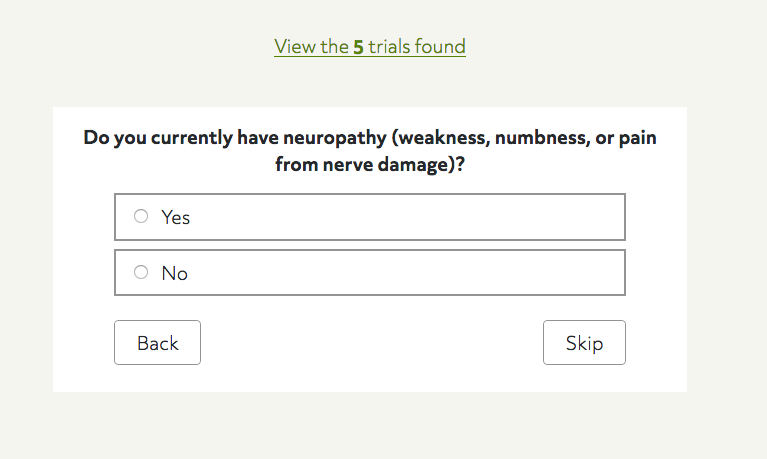 How can I look up trials? You’ll need an official diagnosis before you can participate in a clinical trial. No trials were found as a result of my first search, but when I go back to the tool, I can’t reset my answers. How can I search again? You’ll need to refresh your page or open a new tab to start another search. Have more questions or need assistance? Please give us a call at 800-572-1717 or email us at ResourceCenter@mdausa.org and we’ll be happy to help.